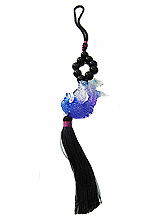 Auspicious amulets play an important role in feng shui as they are easy to carry along and saves space by simply hanging in our living areas. Different amulets serves for different purposes, either as enhancer, antidotes or protectors. Check out our wide range of ever popular amulets that would improve your life significantly! The Phoenix is associated to true happiness, social luck and fame. On the other hand, the amethyst natural crystal is purple in color which is strong in fire energy and when in nine pieces is capable to activate strong fame luck and attractiveness. One may also activate the south corner's fire element with this Nine Amethyst Phoenix if you are seeking for recognition luck, fame and popularity. The fiery amulet brings joyous occasions such as child birth, fame luck, popularity, recogntion, promotion, marriage luck, favorable investment yields, good support from benefactors and property revenues. Vases are excellent symbols of peace and harmony in feng shui. That is the reason why they are called "ping" which can directly be translated as peace and harmony in English. One may have noticed this being the reason why chinese homes normally have good collection of beautiful ceramic vases. It also promises a life free from obstacles and problems. There will not be so many downfalls in your path. It is an important amulet of protection against quarrelsome energy, hiccups, anger and dispute caused by Quarrelsome Stars. This amulet is beautifully tied together.. This three carps embracing the pearl amulet is the manifestation of uncompromising ambition in the ultimate endeavour of aspiration, regal luxury and prosperity. The jade represents the earth element of Period 8. It resembles abundant good fortune, prosperity, successful examination and literary luck. The carps are energetic and determined to resist any big currents in the yellow river. The carps are determined to leap to attain higher achievement to catch a big chinese prosperity coin. They are tastefully crafted by hand. 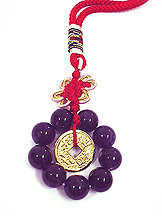 This special amulet is recommended for you to tap greater heights in fortune, prosperity and joyous relationship. When they swim around the pearl, it means abundance ("yuan man"). This fleet of beautiful 8 red jade tortoises are tied in such a way it moves upwards signifying upward mobility in your career and business. The tortoise is one of the four most important celestial animals in feng shui, next to the dragon, tiger and phoenix. 8 tortoises represents stability and strength from all eight directions and is therefore best to create good luck from 8 aspirations in life according to the bagua formula, namely fame, health, descendants luck, wealth, career, networking, love and scholastic ability. Known as the "Pu Pu Kao Shen Tortoise", when organized in such a manner of stack-up stairway formation it signifies incremental success in wealth accumulation. These tortoises also represent connectivity among heaven, earth and mankind, thus making this energizer more potent in attracting prosperity, good health and abundance. The nine amethyst balls with gold prosperity coin is best to activate the auspicious Purple Star #9, which is our future wealth star and a luck magnifying star associated "completeness" and "fullness". Amethyst is purple in color which is associated to fire energy, which is best to activate Purple Star #9 when in 9 pieces. One may also activate the south corner fire element with this amulet. The fiery amulet brings joyous occasions such as child birth, fame luck, popularity, recogntion, promotion, marriage luck, favorable investment yields, good support from benefactors and property revenues. Meanwhile, the 24K gold plated prosperity coin represents long term wealth luck and prosperity. One should activate the Purple Star #9 in the center of their home or bedrooms in 2009 to bring wealth and career expansion opportunities. Carry this amulet along with you all the time. This new rhinoceros amulet is better in design, shape, finishing and more beautiful. The double horned rhinoceros is recommended by Feng Shui masters as an ultimate symbol of protection against robbery, accidents, enemies, office politics, biz competitors and backstabbing. This rhinoceros is carved from natural jade and strung together with the mystic knot to create a hanging amulet so that you could conveniently carry along with you or hang it in your office, car or house for protection. Carry this amulet along with you all the time to prevent peer competition, triumph over back-stabbing, robberies, burgalary, harm and violence at all times. This rhinoceros amulet is also great to counter flying violence star #7. The crab's ability to circumvent to any dangerous situation makes it the most powerful symbol to go against competition. Its powerful claws can pince on to any enemy tightly. And the only animal that can run side ways and digging a hole to run away from danger, it is assured to help you counter any competitor who can be using underhand tactics. It guarantees that your competitors will fail in their attempt to overcome you besides destroying their illful wishes. In real life feng shui application, the crab is widely used in the competitive Shanghai business center as company logo because of feng shui masters' belief that it is a symbol meaning "coming out as TOP of all competition". It will assist you in gaining important insights into developing a strategic plan and staying ahead of competition. Best suited for those seeking for promotion, win any competition, strike a lottery and for business success. This flamboyant hanging Double Carp made from ceramics is the manifestation of uncompromising ambition in the ultimate endeavour of aspiration, regal luxury and prosperity. The ceramics represents the earth element of Period 8. Double carps resemble joyous unions, marriage luck, abundant good fortune, prosperity, successful examination and literary luck. Both the carps are energetic and determined to resist any big currents in the yellow river. They are tastefully crafted by hand and made in bright red colors. Being the most powerful emblem of perseverance, this Dragon Carp has the head of a dragon and the body of a fish. This symbolises that the carp has successfully transformed into a dragon. It is a symbol of literary eminence and passing examinations with distinction. Carry this auspicious dragon carp to enjoy abundant good fortune and prosperity luck. For business, hang it on your work desk to achieve career success and competitive advantage over your competitors. For students, carry along with you all the time and hang one at the study desk to attain academic excellence and win yourself place in the university. Made from good quality jade, the item is finest in craftmanship, well finished and specially made to be tasteful in esthetics. Those who are sitting for important examinations and seeking to enhance their education should carry this amulet along with them. 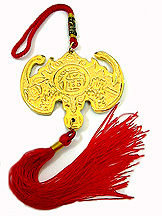 This hanging fortune bat amulet in ancient style normally prescribed by ancient feng shui masters is made from polished brass. Bat is called "fu" in chinese which carries the meaning good luck and good fortune. The symbol of bat resembles long life, happiness and good luck, and implies "fortune just in front of you". The bat has the word "fook" and on its reversed side the word "choy" on its stomach to doubly enhance wealth, prosperity, happiness energy and realize smoothness in our endeavour. 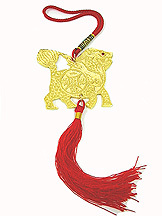 This bat is depicted biting a chinese coin and the whole plaque is enhanced by a mystic knot and red tassel. This plaque is normally hung in the front portion of your house or at your maindoor or any chi entry points to invite good fortune, wealth, health and natural death at a ripe age. Bells and vases are excellent symbols of feng shui. Together, the derive in a famous chinese saying "Choong Surng Peng Orn". This chinese term simply carries the meaning of a "safe life forever", complete with riches, never ending prosperity, happiness, free of hostility/conflicts, outstanding career, great family life and blessed with many successes for a thousands of years. Therefore it is an important amulet for protection against unnatural death, danger and obstacles in life. Suitable as gifts for those in hopeful of an excellent life or hoping for turnover luck starting from now. The presence of Twin Dragons depicted in this powerful amulet would ease our efforts to have full grip and control on our fortune and luck. The amulet is tied with the mystic knot and a genuine citrine stone at the edge to amplify your luck in Period 8 because mystic knot signifies multiplication of "8" and citrine is endorsed to be the Period 8 wealth gem. Citrine energizes the auspicious earth energy in Period 8. This talisman creates strength and vibes to radiate continuously to transform negative Chi into positive. This overcomes obstacles, annual dangers caused to zodiacs, bad luck, harm from opponents and competition. Rub it to create beneficial outcome especially going through hard times, making hard decisions or even interviewing for a job you desire. This genuine rainbow obsidian wu lou amulet is highly revered for their power to overcome accidents, uncover and protect against evil attempts, prevent bad intentions, arrest bad luck and healing/curative properties. It is also particularly powerful to fight stress and depression, rejuvanate self-confidence and stimulate analytical capabilities. Not all obsidian crystals have the third eye. All our obsidian wulou's are specially selected from those with the "third eye" which makes the item most powerful. This third eye assist us to see the unseen and sense the unforeseen. It is knows as the mirror of soul and is effective in revealing what is truly reflected in the souls of others and yourself. They are especially beneficial for those who want to hang them outside their bags, hang it in their office cubicles to counter evil intention, hang it near their beds and carry it in their pockets to arrest ailments, enhance health, mind clearing and luck enhancement in their endeavours. The presence of the double happiness symbol is an auspicious enhancer for those who are seriously looking for marriage luck and proposals from the one you love. This special amulet of conjugal happiness is carved with the powerful double happiness symbol in the center, being surrounded by dragon and phoenix (another powerful symbol of conjugal bliss) and the fortune bats. This is an all-in-one auspicious amulet with all these three powerful symbols together. 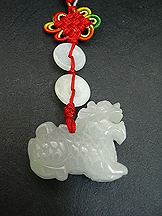 The amulet is made from natural red adventurine and is tied with the mystic knot with red tassels in its tail to signify endless "double happiness". The double happiness symbol is a very powerful symbol of conjugal bliss and happiness in marriage and family life. It simply brings double blessings from heaven. The item is also a perfect wedding gift for your close friends. Five bats is the representation of five blessings from heaven: longevity, wealth, health, love and a natural death at a ripe age. Five bats represent the yang symbol of prosperity. It would bring us extreme happiness and a peaceful life with few problems. Together with the symbol of longevity in the center, it is an auspicious emblem of prosperity, happiness and longevity.The presence of this symbol is an auspicious enhancer for those who are seriously looking for long lasting good fortune, wealth and excellent health. This special longevity-fortune amulet is carved with five bats and a symbol of longevity in the center and the item is made from genuine multicolored jade with red tassels. The mystic knot carved out of jade is the most influential symbol in Period 8. Those wearing or displaying this powerful mystic knot symbol will have the influence of the number 8 multiplied, thus enjoy extra good fortune. Mystic knot is also equivalent to the infinity sign done endless times. Tying to the 5-element mystic knot, red thread and tassel activates its yang energy, thereby making its properties come to live. The gold ingot symbol on top of the mystic knot would bring exceptional wealth luck. The jade is also a strong representation of earth energy, which synchronizes with the base element of Period 8, thereby making it most potent. This product can be hung on handbags, in cars, offices, living rooms and bedrooms to multiply your health luck, wealth luck, relationship luck and extremely good fortune in all areas of your life in the Period 8. Peony signifies beauty, romance and the magic feelings of youth. Displaying the peony always benefit ladies who are single as it is said to bring many suitors for their hands in marriage. The beauty and love making skills of the famous concubine an emperor in China was likened to the peony. She decorated her bedroom with peonies and this kept the emperor's libido desire for her to continue unmatchable. The presence of the peony acted like a love potion. Ladies who display peony in their surrounding will encourage libido of their desired men. Single men are also recommended to display this best flower of love in the southwest corner of their bedroom as powerful emblem of conjugal love and activation of yin energy to bring prospective female into their lives. Cicada is regarded as the symbol of long life, happiness and eternal youth due to its intrinsic properties of being the longest living insect, for as long as up to 20 over years. The cicada is the best emblem of immortality and protection against office politics. It is also known as "Request Fulfiller". Tying to the 5-element mystic knot, red thread and tassel activates its yang energy, thereby making its properties come to live. The gold ingot symbol on top of the mystic knot would bring exceptional wealth luck. The jade is also a strong representation of earth energy, which synchronizes with the base element of Period 8, thereby making it most potent.